Jack o’ lanterns, cider, masquerades, witches, and ghosts—many of the holiday staples that we still associate with Halloween were familiar to Connecticut residents in the early 1900s. Likewise, the tricks that sometimes accompany more polite forms of celebration irritated authorities and hapless victims around the state, then as now. Firefighters, too, found themselves busy each year when Halloween came around. In 1921, engine companies in Hartford extinguished six nonlethal blazes in addition to answering false alarms. On Zion Street, a group of rowdies had piled rubbish into a wagon and set a lit torch to it. Then, they had pushed the wagon with its blazing cargo downhill. By the time firefighters arrived, the runaway wagon had hit a curb and spread the fire to nearby trees. By 1921, Hartford had retired most of its horse-drawn firefighting equipment in favor of motorized vehicles, but collisions with trolley cars still presented a danger as crews rushed through the city streets. And, the trolleys themselves were subject to Halloween hijinks. In addition to disabling individual trolleys by detaching the pole used to transfer electricity from overhead wires to the car’s motor, troublemakers pulled the “old stunt” of placing dummies on the rails, much to the distress of drivers. 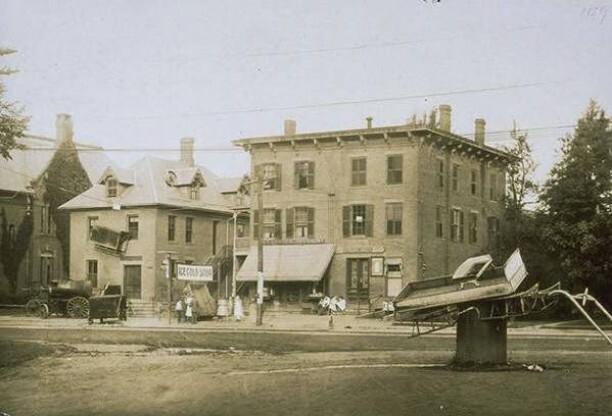 In Wethersfield, one line ground to a halt on Halloween when an oil barrel placed on the tracks became wedged under the trolley car’s front bumper. Other popular pranks of the early 1900s included dashing away after ringing doorbells, tipping over ash cans and rubbish barrels, setting small bonfires, and taking common objects, such as street signs, gates, and wagons, and installing them in new, unexpected places. For instance, tricksters in Windsor managed to suspend a sleigh from a two-story building and perch another awkwardly by the roadside.